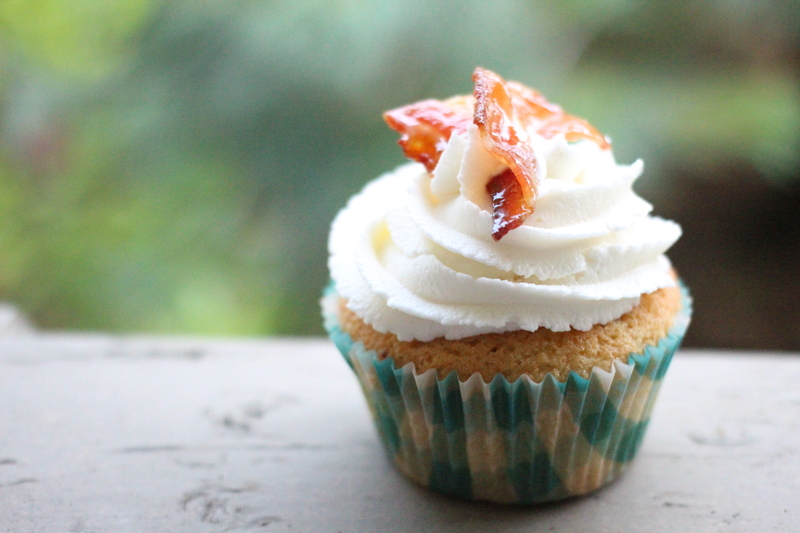 Weird, but Good: Maple & Bacon Cupcakes – amandarobots. That being said, there are few recipes in this world that I see and feel like I have to try. Mostly I just stick with the classics – vanilla cupcakes, chocolate cupcakes, brownies, chocolate chip cookies, and so on. I am not by any means an adventurous baker. But Jemma’s video for Maple & Bacon Cupcakes made it look so delicious that I couldn’t not try it. It’s bacon in a cupcake, and as a fan of both those things, I got excited. The recipe is hers, but I had to do some fiddling around with it for two reasons: one, she’s in the UK, which means all her measurements are in grams and Celsius instead of cups and Fahrenheit; and two, some of the ingredients she asks for I either couldn’t get or didn’t have. That being said, here’s her recipe the way I made it! Once the cupcakes were cool, I prepped a decorating bag with a Wilton 1M tip and no coupler.Then I spooned some of the icing into the bag and piped on a swirl. To top them off, I sliced some extra pieces of bacon and placed them in an X shape on top. The consistent response I got is that they’re weird, but good. The bacon inside the vanilla cupcake adds a very different texture. If you’re feeling adventurous, give these a try! I can imagine these would taste lovely!